A decade on, the Dallas Art Fair is holding its own and looking toward an even bigger future. 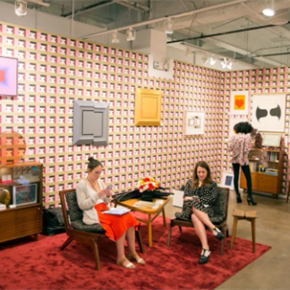 “It snuck up on me,” Dallas art collector and philanthropist Howard Rachofsky told artnet News of the growth of the Dallas Art Fair. The event’s tenth edition, which opened to VIPs on Wednesday and to the general public today, features some 93 international galleries. It’s a far cry from the intimate affair founded by Dallas real estate developer John Sughrue and curator Chris Byrne in 2009, which drew around 30 dealers. Some who have attended since the fair’s early days recalled participants back then showing Western-style jewelry alongside works of art. When this reporter was here last, in 2013, there was music playing over the PA system, giving the space the air of a shopping center. This year, there is no music—and no turquoise, either. But there are top-flight international exhibitors like James Cohan, Luhring Augustine, and Marlborough in town from New York (Gagosian was here last year), along with Angelenos such as Praz-Delavallade and Luis de Jesus. Other exhibitors have come from even further afield, including Carbon 12, from Dubai; Kerlin Gallery, from Dublin; and Whitestone, which has spaces in Tokyo and Hong Kong. Many dealers are offering the same kind of challenging work you’d expect to see at a fair in any of those places. But in its first decade of existence, the Dallas Art Fair has managed to avoid becoming the kind of paint-by-numbers event that could be packed up and reassembled in any international city. “’Regional’ is not a pejorative in describing this fair,” said one dealer. Indeed, while “regional” fairs may be dismissed by some as small-fry, longtime participants and patrons of the Dallas Art Fair say it, and other events of its kind, have an important role to play. They can help nurture local collectors and, at the same time, support smaller dealers who might not be able to afford to participate in expensive mega-fairs. The fair also makes it relatively affordable to participate. The largest booths go for $32,500 and the smallest for $9,500. Medium-sized ones are roomy enough that two dealers can share, which means that, in some cases, each can recoup the cost of the booth by selling a single work. By the fair’s first public day, Paul Kasmin had already made back its booth cost in spades. It sold Lee Krasner‘s Water No. 18 (1969), priced at $225,000, and Milton Avery‘s Adolescents by the Sea (1948), priced at $375,000. Such hefty price tags are rare for Dallas, where dealers do much of their business in the four- to five-figure range. James Cope of Dallas’s And Now gallery brought more typically priced work, with asking prices ranging from $5,000 to $30,000. Before lunch during the VIP preview on Wednesday, he had sold three works by sculptor and painter Maximilian Schubert. Other dealers, meanwhile, are showing art priced somewhere in the middle. Houston’s Inman Gallery is offering works as high as $65,000, while New York’s Van Doren Waxter sold work priced at up to $75,000. Standards—and prices—have climbed at the fair as Dallas’s scene has grown. Collectors Alden and Janelle Pinnell opened The Power Station, a project space in a former Dallas Power and Light building, in 2011; Howard and Cindy Rachofsky, who routinely make lists of the world’s top collectors, inaugurated the Warehouse to display their holdings in 2012; and Pauline Karpidas opened another former warehouse space to show her collection in 2015. For many dealers, including New York’s Rachel Uffner and San Francisco’s Claudia Altman Siegel, the gateway to the Dallas market has been the Rachofskys’ annual Two x Two benefit for the AIDS research foundation amfAR and the Dallas Museum of Art. The Rachofskys travel the world to solicit gallerists to donate work and attend the auction, which is now in its 20th year. While in town, they meet other major patrons such as Deedie Rose and Marguerite Hoffman, as well as collectors of edgier art like the Pinnells, Derek and Christen Wilson, and Patrick and Lindsey Collins. New York dealer Isaac Lyles, of Lyles and King, is a Dallas native who got his first exposure to international artists like Gerhard Richter and Sigmar Polke through the collections of the Rachofskys and the Roses. “It changed my life,” he said. He’s showing at the fair for the first time, bringing paintings by Trudy Benson and Chris Hood priced from $10,000 to $20,000. “Patrons of the arts in Dallas see what art can do for a community,” he said. To be sure, the fair has room for improvement. Rachofsky admits that its current home, the somewhat sterile Fashion Industry Galleries, is “terrible.” And he hopes to see more major dealers like Blum & Poe, David Kordansky, and even a larger player like Lévy Gorvy give it a try. He predicts that a dealer could sell work at higher prices than the fair is currently known for, too. As long as collectors don’t think the piece had been previously offered and gone unsold in New York or Miami, he said, he could envision Dallas hosting a seven-figure sale. “I don’t see why not,” agreed New York-based art advisor Anne Bruder-Sharpe, who grew up in Dallas and has attended the fair since its first edition. “Before, dealers were bringing easier material,” she noted. But as local collectors have spent more time traveling to other fairs and getting involved with institutions like the Dallas Museum of Art and Dallas Contemporary (whose director, Justine Ludwig, was recently appointed director of New York’s Creative Time), they’ve become open to more challenging work. And those that don’t have the time to travel rely on advisors like her. “That’s how my business has grown,” she said.